Versatile, tightly focused, and ultimately a hugely impressive multieffect - as long as you don't mind it running in Reaktor/Player. Unusual but musical filter and delay. Hugely versatile modulation. Morpher and Macros for live performance. Flexible routing with feedback options. Pitch quantised frequency sweeps. No envelope shaper sidechain. Individual effects settings can't be saved. 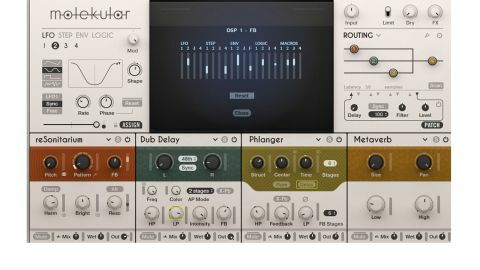 Running in Native Instruments Reaktor 5 or the free Reaktor Player (included), Molekular is a modular effects processor designed by Zynaptiq's Denis Gökdag for use in the studio and on stage. It consists of four effects modules; a modulator section with LFO, Step, Envelope and Logic modulators (four of each); a Routing section for organising signal flow (including feedback); and a Morpher for performing and programming dynamic effects shifts. Each of the four effects modules has its own library of processors from which to choose - roughly classified as spectral (filters), temporal (delays), modulation (phaser, chorus, etc) and distortion - as well as five common ones: Dual Delay, Equaliser, Filter, Level and Metaverb. Level works with the modulators and its own Pattern Editor to facilitate rhythmic gating and panning effects, while the other four are self-explanatory. That Pattern Editor is a recurring feature of Molekular - it's essentially a step sequencer that controls an assigned combination of parameters. In Level, for example, its up-to-16 steps control Level, Pan and pulse width (PW). Up to eight patterns can be stored and recalled via the Pattern knob or one of the four assignable Macro knobs in the Morpher, or you can modulate through them using one of the assignable step sequencers or other modulation sources. The first DSP module (spectral) offers seven unique effects with exotic titles such as reSonitarium, Plagiarism and Dual Comb. The processes involved are complex, but to give an example, Spektral Smear divides the signal into 256 or 512 bands, then separates them into two groups, divided by an adjustable amplitude threshold. "The results are left-field to say the least"
Two sets of Attack and Release controls are then used to 'smear' each group in time, resulting in anything from warbly blips to surreal drones. You can crossfade between the two groups, add random modulation to the phase of the bands, and apply brickwall filters to the top and bottom. The results are left-field to say the least. Routing a simple electro kick through it, we recorded a dynamic performance over four minutes that could easily have formed the backbone to a track thanks to the interestingly tuneful resonance of its evolving sound and 'space'. The nine unique effects of the 'temporal' module include Angel Delay, Freezer, Iteration and Reverseoid. Again, it's esoteric stuff and the results are wild and wonderful, with rarely a straightforward echo to be heard. Delay times are generally syncable to tempo, but setting dotted ones is a slightly long-winded process. The 'modulation' module's eight unique effects include Filterbank, Frequency Shift and Dark Forces. With Filterbank, you set the frequency of the lowest of five 24dB/octave band-pass filters and a pattern control varies the relationship of the other four to create heavily resonant tones. Using modulation and the Morpher, this can turn any sound into a complete performance instrument on its own. The fourth module's six distortion effects including Modulo Fry, Slam Dunk and Track OSC - nasty digital distortion, aggressive over- compression and a pitch-tracking synth respectively. Extreme effects are very much the order of the day with this one - often too extreme to know what to do with in a musical context, in fact. You can arrange the four modules as you like in the Routing section, within a range of parallel/serial setups. One particularly musical aspect to Molekular is the ability to quantise the pitch of all pitch-related parameters, limiting modulating sweeps to specific notes or chords in the desired key. You can also create up to eight different chords that can be modulated manually or with a step sequencer in order to follow the chords of your song. Similarly, the Time Quantise feature lets you hold the pitch for a certain note length before moving to the next note or chord. Using these two features, you can keep the effects in tune and time with your song. To assign Molekular's 16 modulation sources, you click a modulator's Assign button to reveal mod depth faders alongside all viable targets. Alternatively, double-click a parameter name to open a window showing all 16 modulation sources for that target. Of the four mod sources, the LFO and Step sequencer are pretty standard fare, the Envelope and Logic not so. The Envelope section hosts three envelope generators and an envelope follower, and the envelope design includes a step sequencer for programming envelope trigger points. Attack and Release settings shape the envelope, while the Gate knob sets the point in the step at which the release phase takes over from the attack. "Rarely have we come across such a creative processor"
The rhythmic modulation potential here is vast, but you can't sidechain the envelope follower, alas. The Logic modulator combines two sources via eight operating modes, enabling, for example, an LFO to modulate a step sequencer. There are plenty of great 'snapshot' presets, although to save your own, you have to be running Molekular in the full version of Reaktor (the state of the Molekular Ensemble is saved within your DAW project, though, of course). One thing you can't do is save and recall individual DSP effect settings, which would obviously be useful. Molekular is a hugely inventive device offering enough depth and complexity to challenge even the most hardened sound designer. At the same time, its diverse presets can give an immediate facelift to any prosaic loop. But what sets it apart from most other effects units is the combination of Morpher, pitch and time quantisation and macro controls, which permit extreme effects shifts with minimal tweaking - ideal for the stage. Rarely have we come across such a creative processor.